Indoor video walls are bold, dynamic displays that engage customers and redefine interior spaces. Corporate lobbies, casinos, hotels, churches and airports use interior displays to communicate information, promote their products and services, and easily update wayfinding. Initially, most video walls were constructed by configuring several LCD TVs into a video wall, but since televisions are engineered for home viewing, they are limited in their flexibility for other uses. Their consumer-focused design limits the LCD’s commercial application and overall impact. No Seams: Black, plastic frames around TV screens create unsightly seams. Even professional-grade plasma displays have distracting breaks in the image. 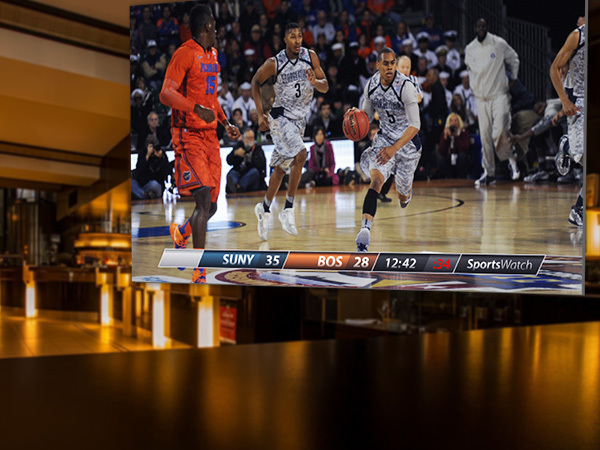 Watchfire’s zero bezel video walls provide full, unhindered images, even in extremely large or radial installations. Entertain and share information with fans, guests and customers, with great-looking, no-bezel indoor displays. True Color Calibration: TV walls need to be regularly calibrated and realigned. Age, model and settings can create a mismatched patchwork of colors and brightness. Watchfire’s high contrast LEDs deliver a rich color palette. Before it even leaves the factory, each display is color calibrated for near perfect color and brightness uniformity. LED video walls are a solution for every environment. 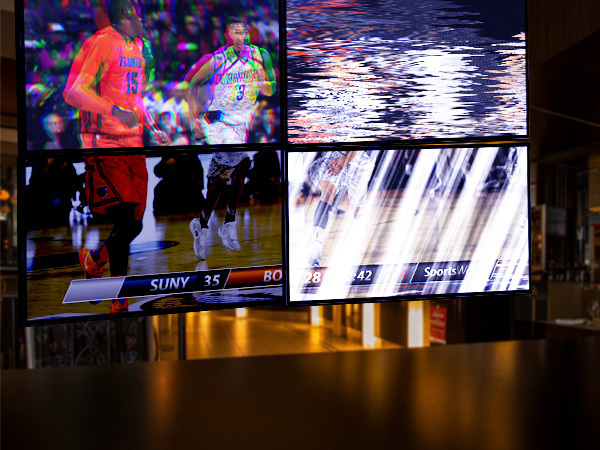 Because LEDs emit direct light, our video walls have the same vibrant brightness in any lighting condition–from the fluorescent lighting of a sports arena, to the natural light of a sports complex or the dim lighting inside a sports bar. No Glare: LCD displays have glass screens, which cause reflections. Some flat screens compensate for this with a matte coating to reduce glare. Unfortunately, the coating also blurs the image, reducing contrast and narrowing the screen’s viewing angle. Watchfire interior video displays are glare free. Viewers can appreciate your content without seeing their reflection at the same time. And any additional lighting, like spotlights, won’t impact video quality or visibility for viewers. This makes LED digital displays ideal for concert venues, e-sports arenas and gaming facilities. No Synchronization Needed: Using a processer to divide video into pieces and reassembling them across multiple TV screens can cause scaling problems and sluggish timing. LCD video walls require routine synchronization to maintain uniformity. Watchfire practices what we call “elegant engineering” — designing and implementing the most effective, streamlined processes to create the highest quality LED digital signage available. This is true for our video processing too. In most applications, a single signal is sent to the display, so there’s no need to synchronize video. Watchfire’s Ignite OPx software allows you to divide the display into zones with different inputs if you want to maximize your content. The Ignite interface is incredibly intuitive and easy to use, so there’s no need to call tech support in order to recalibrate or realign video. Easy Service and Upgrade: The life expectancy of an LCD screen is roughly half that of an LED display. Because LCDs are comprised of solid-state electronics, repairs typically require a complete replacement of that LCD unit. Watchfire’s indoor displays have an interchangeable and interlocking modular design. If needed, a single tile can be replaced without changing other parts. This means service is fast and easy, with optimal up-time. Our modular construction allows video walls to be configured in various sizes and shapes. Take advantage of Watchfire’s experience in offering the best of digital display technology and choose a video display wall that offers you superior viewing, reliability and flexibility. It’s time to enjoy the newest generation of video displays.